The annual Super Bowl, the championship game for the National Football League, is always a good opportunity for an overview piece. Also see this commentary by Kareem Abdul-Jabbar, "An open letter to the NFL's owners," (Guardian). Harder to get performers for the half time show. Controversy over protests by Colin Kaepernick, former quarterback for the San Francisco 49ers, and his failure to get a slot with another team has been national news for a long time. This year, many performers rejected the invitation ("Star names say no to Super Bowl show in support of police brutality protest," Guardian). Team owners with little loyalty to cities. 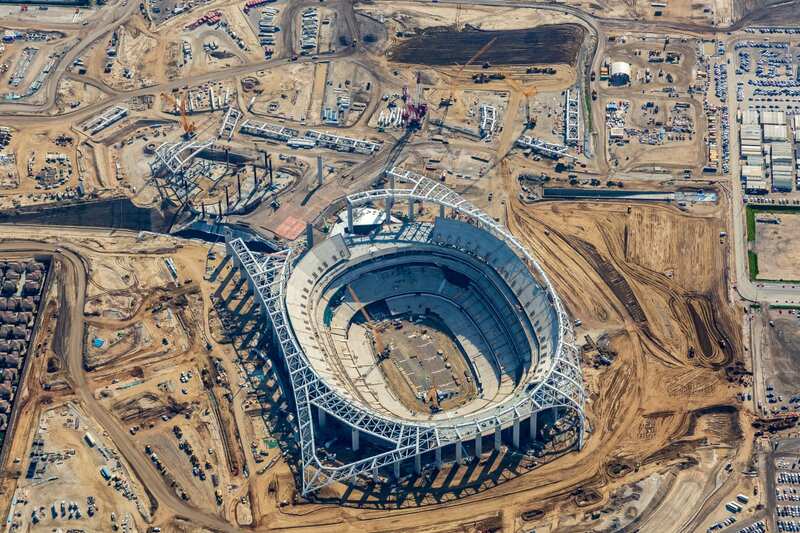 Besides the public funding of stadiums issue, although here and there are some instances of private funding, such as with the forthcoming stadium in Inglewood for the Rams and the Chargers, which will anchor a $5 billion mixed use project, the Washington Post's Jerry Brewer has a great column, "In St. Louis, jilted Rams fans might actually root for the Patriots in the Super Bowl," about fans in St. Louis, where the Rams had played for about 20 years, and their reaction to the team's newfound fortune in LA. Under construction: the stadium element of the LA Stadium and Entertainment District at Hollywood Park. One fan quoted at length made the point that the owner tanked the performance of the team in St. Louis, to justify a move. Of course, St. Louis fan animus ought to be married with the fact that the St. Louis Rams moved from Los Angeles, in response to the Cardinals team moving to Phoenix. Also see "Los Angeles now has a Super Bowl team, but does anyone care?," (Guardian). A good amount of local news coverage. Based on viewing front pages posted at the Newseum over the past couple weeks, the Atlanta Journal-Constitution has been running special sections and special reporting about this Sunday's Super Bowl, #53. 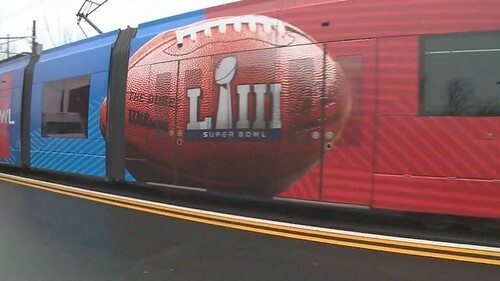 Articles include planning by the local transit system to deal with the crush ("Atlanta Super Bowl LIII: How MARTA's preparing"), the impact on restaurants ("Super Bowl 53: How Atlanta restaurants are preparing"), special preparations by the Hartsfield Airport ("Atlanta airport to spend nearly $1.4 million for Super Bowl," "Atlanta airport geared up for Super Bowl crowds"), and whether or not the new Mercedes Benz Football Stadium which is home to the Atlanta Falcons has had positive revitalization impact on area neighborhoods ("Old neighborhoods around Mercedes-Benz Stadium remain work in progress"). Transit. I didn't know, but one thing the MARTA system is doing is 24-hour rail service before the game, and they started early than they said they would ("MARTA launches 24-hour Super Bowl rail service a day early"). Four bus lines are also on 24-hour service, and the Atlanta Streetcar will run every 9 minutes on game day. 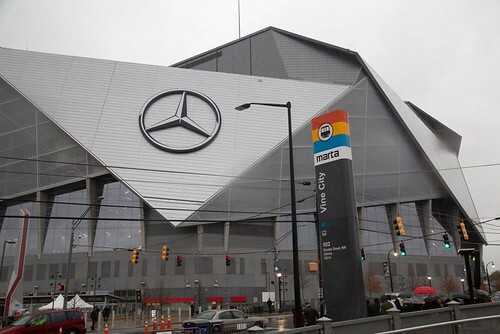 MARTA also invested in wayfinding signage ("MARTA spends big for new signs to guide Super Bowl fans," WSB-radio), which is a need because the station serving the Mercedes Benz Stadium hasn't been renamed to reflect the stadium. Photo: Steve Schaefer for the Atlanta Journal-Constitution. But at the same time, public access to the MARTA station at Vine City, which provides service to the Stadium, has been restricted. 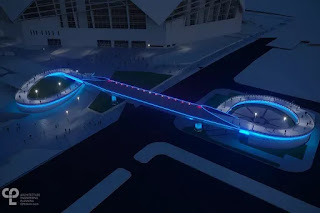 Rendering of the new pedestrian bridge over Northside Drive to Mercedes Benz Stadium. The pedestrian bridge built to link Stadium and Vine City Station won't be open to the public for the Game ("Downtown’s $27M new pedestrian bridge won’t open to public for Super Bowl LIII," Curbed Atlanta). Access will be limited to official personnel mostly affiliated with the NFL. But funding for the project, which doubled over the construction, was justified on the basis it would be used for game day mobility by attendees. "short" loop 2.7 miles long, connecting to the Martin Luther King Historic District and MARTA's Peachtreet Station. It is supposed to be an element of a bigger system, but expansion has been stymied in the face of opposition. In the framework (see next post) I've been creating to strengthen local community return from public funding of stadiums, football stadiums have the worst return because they are big, surrounded by parking lots, and have very few events. 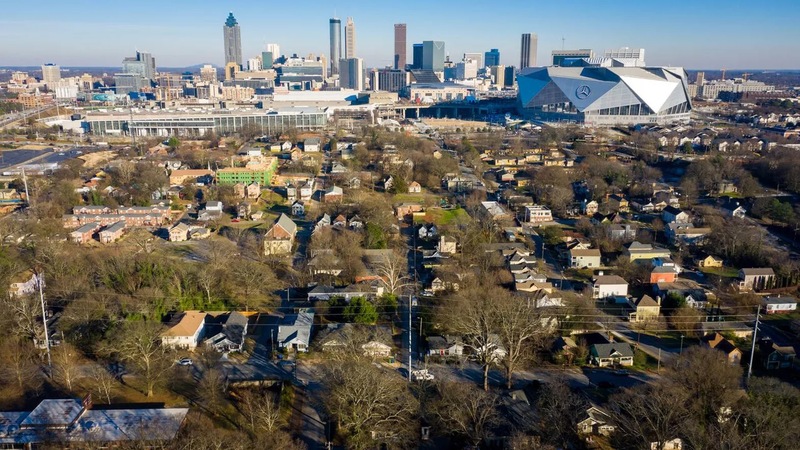 It will be interesting to see if the Atlanta stadium will be different, although there is no question that they have invested some money in programs and other projects in the abutting neighborhoods ("Building a stadium, Rebuilding a neighborhood," New York Times). Home Team Documentary. This documentary looks at the impact of the Mercedes Benz Stadium on the Westside neighborhoods. "I'd hear fans, just people around me, just complaining about it all the time. So I, you know, said to our management team, we need to price it every day the same way they would pay any place else they went in the city of Atlanta," Blank told CBS News' Dana Jacobson back in 2017. It's meant happier fans, and also higher profits. According to Falcons president and CEO Rich McKay, fans spent 16 percent more overall in the first year, even with price cuts of 50 percent. Super Bowl community benefits projects. 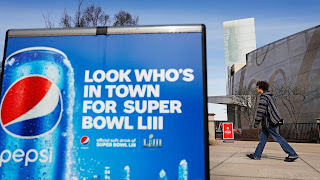 In recent years, local Super Bowl Committees are active in doing/funding "community benefits" projects as a partial recompense for the variety of public supports provided to the game. In Minneapolis, they did more than 50 projects, 1+ per week in the year leading up to the bowl. In Atlanta, it's called the Legacy 53 initiative. Projects include parks revitalization and the mural project discussed below ("'Legacy 53' creates lasting impact on Atlanta long after the Super Bowl," Fox 5 Atlanta), but a comprehensive list of projects isn't readily available. Animus in New Orleans. It's interesting that fans of the New Orleans Saints, who argue that their team was robbed of a trip to the Super Bowl because of poor officiating, have been protesting in various ways. 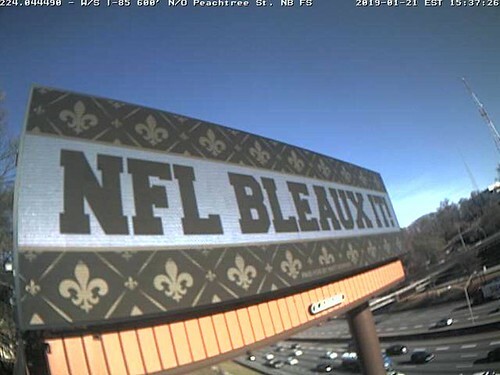 One fan, car dealer Matt Bowers, has paid for billboards with protest messages, which have been placed around Atlanta. Sponsor conflict. Interesting too is that Coca-Cola is based in Atlanta, but Pepsi is the official sponsor of the game, and so lots of special Pepsi promotional ads are being mounted, in close proximity to various Coca-Cola properties ("Pepsi comes to Coke's hometown of Atlanta for the Super Bowl," Marketplace). 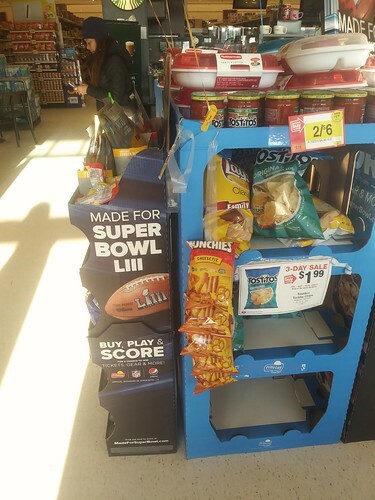 Promoting local history and culture for consumption by Super Bowl attendees. 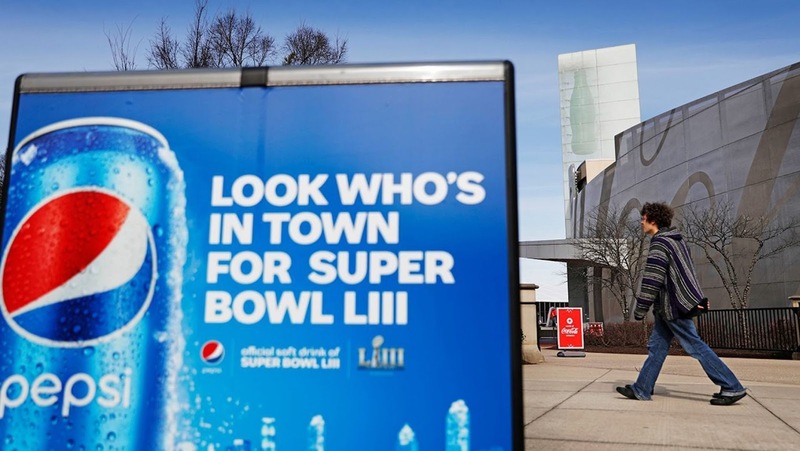 Many communities develop a variety of programs around locally relevant places and history in advance of the Super Bowl, aiming to get patronage. Generally, these efforts to have much return, because the majority of attendees are only interested in the game and/or don't stay long enough to take part in activities outside of the game. But I was surprised earlier in the week by an article in the New York Times, "Atlanta Stokes a Civil Rights Conversation for Some Super Bowl Players," which described how the New England Patriots team visited the Martin Luther King Jr. National Historic District in the Sweet Auburn district of Atlanta, and other sites related to the Civil Rights Movement. Leading up to Super Bowl LIII, Atlanta, Georgia, is being outfitted with 30 new public murals depicting the city’s strong civil rights legacy. 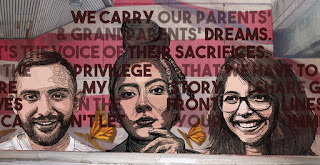 WonderRoot, a local arts and advocacy organization, has teamed up with the Atlanta Super Bowl Host Committee to detail these stories in a new citywide initiative called Off the Wall: Atlanta’s Civil Rights and Social Justice Journey. 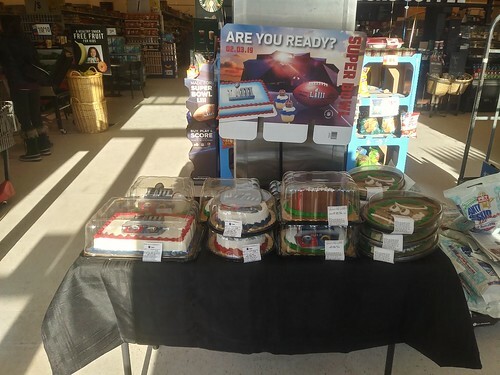 Super Bowl themed cakes at the Giant Supermarket, Silver Spring, Maryland. That's a great idea, take the message to the places where people will be, and hopefully some of them will go to the places. Glenn Kaino, a conceptual artist from Los Angeles, brings to life the one-armed salute by the sprinter Tommie Smith at the Olympic Games in Mexico City in 1968. The decision by Smith and his teammate, John Carlos, to raise their clenched fists while wearing black gloves on the winner’s podium remains one of the most iconic gestures in sports and beyond. What about local music history being reflected in the half time show? One way to make the game have more of a local relevance would be to program the half time show's music around relevant local performers ("Super Bowl halftime show won’t reflect Atlanta’s black music history," Guardian). 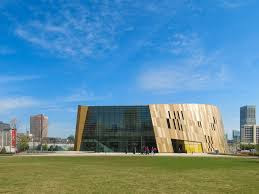 Free admission to the National Center for Civil and Human Rights. FedEx, based in Atlanta, sponsors an annual free admission day to this museum. This year it was yesterday, in conjunction with the Super Bowl. Coca-Cola has provided a donation enabling one month of free admission, also partly during this period ("Coke’s Super Bowl surprise: free admission to civil rights center," Atlanta Journal-Constitution), and through the entire month of February. And in the farce that is the Atlanta Streetcar: they had to shut it down because there were too many people Downtown. What good is mass transit if it can't handle any mass? Well, we come at this differently. I argue that one scale at which to plan transit is at the intra-district scale. In fact, I'll be updating that thread soon. And by definition, that kind of transit will never be capable of serving tens of thousands of people per hour for multiple hours per day. The issue is if it gets overwhelmed during ordinary game days? 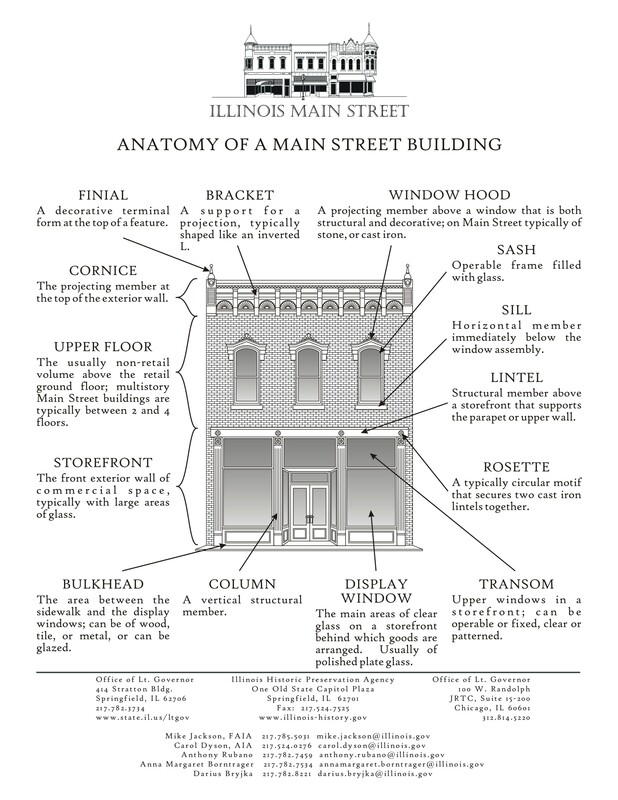 Do you know anything about that? I'll try to check. Otherwise, I think you have to accept that intra-district transit works except in extraordinary situations such as this one. There is a "Business Connect" business development program for minority businesses and the Super Bowl. Nice piece about the economic impact of the Super Bowl in Atlanta, calling attention to previous games in Minneapolis and Houston. Economists say the impact is about $50MM; the touts a lot more. And the pro-economic impact analyses don't take into account the cost to taxpayers of the stadium. when a big part of the public case for building the streetcar is hosting events - and then you shut it down for the big events... Yeah, you deserve a lot of scorn. The reason for this is simple: mixed traffic streetcars aren't very robust, and Atlanta's project in particularly is exceedingly poorly planned. Again, if you have to shut down the mass transit for a mass event, that's a bad sign. NFL makes lots of incredible demands including (1) exemption from state and local taxes; (2) free advertising for the "NFL Experience" and a whole lot of other stuff that it wants freely provided. FWIW, yesterday the MBTA Commuter Rail was unable to deal with the large numbers of people using the system to come down to Boston for the New England Patriots parade. Both in the morning and evening. to be able to respond to temporary surges. MARTA ridership was double over a typical weekend, with 270K trips on Saturday and 155K trips on Sunday. The streetcar’s failure during big events in Atlanta has nothing to do with a lack of slack capacity, it is everything to do with poor planning. The system was designed to fail in situations like this, and yet they used events as a big selling point. It’s a sham. The MBTA commuter rail failure is different, but still a result of the fundamental failures of MBTA to take note of reality. There’s a reason why MARTA didn’t stop running, why the T didn’t stop running, but the commuter rail and the streetcar did. Different reasons, but the same kind of error in thinking.